Brainstorming with friends is not only fun, but inspiring. It can light a fire in your heart, clear your path, and propel passions. I have never produced so many journal pages, creative projects, or artwork as I am now. Hours and days spent, each week, experimenting, pushing myself forward, and trying to create vivid, unique work. But we learn when we teach, just as we do as students, and I'm full to bursting with new things to share. So I thought, as a special for Easter, I'd offer an All Access Pass through the end of April, for newsletter subscribers & past students ONLY. For $150, you'll get an upgraded membership on my Ning network that will automatically grant you access to every single classroom through April 30, 2015. No more sign ups. Just automatic access to everything coming up and everything already over there. 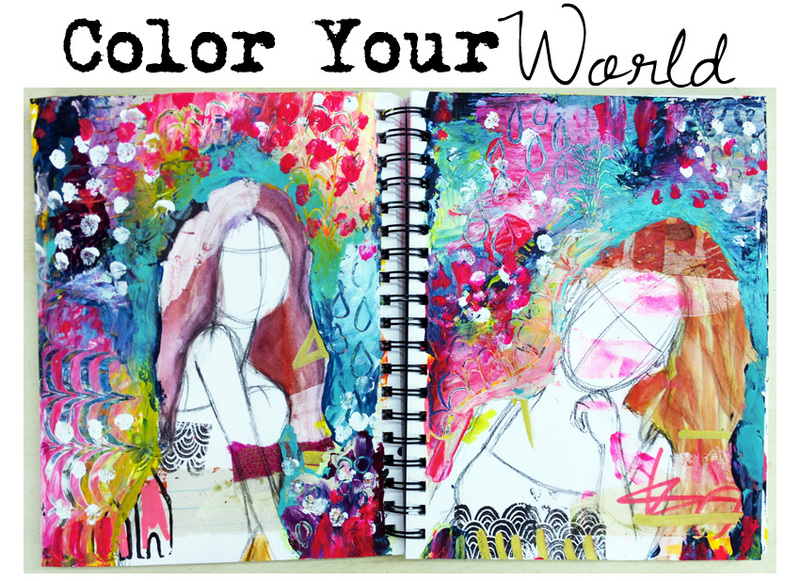 Color Your World will explore color, texture, and mark-making through your art journal. We'll learn about the colors we love, draw expressive figures, and learn various texture and mark-making techniques with acrylic paint. Friendly Faces Two is the natural next step in my illustrative drawing adventure: how to draw faces at any angle. The goal is to get you not only confident with drawing, but to never again feel limited in the girls (and guys!) you can scribble in your journals.